Some girls grow up with a hope chest. A chest filled with hopes and dreams for a future filled with love. I did not. No chest of hope for me. When I started the social work program 3 years ago I did have hope though, hopes and dreams of a future as a healer. I took those hopes and dreams and started filling a basket with them. Over the years I have found pieces of a future I am trying to manifest, they all went into my basket. Symbols and sounds and textiles that all meant something to me and that I knew would one day have a place in the healing space I would be creating. While I was in the Capitol we stopped by a store where I found a few more items for my basket. When I got home I took inventory of what I have collected over the years. Just a few things but all very much filled with hope for a future filled with love. No one made a hope chest for me when I was a girl. I was not granted that consideration. I created my own hope, I started collecting pieces of my dream, and one day my hopes and dreams will live in a space of my own making and I will know I did this. Me. All by myself. This lyric is playing in my head as I sit and think about something hubs and I were talking about earlier this evening. It is from the song What Sarah Said by Deathcab for Cutie. It is one of my hubs and I’s favorite song by that band. I was thinking about it because we saw something on TV which prompted a conversation about our future children and the future of our future children. As I am laying here mulling it all over again in my head I started thinking about hope. I am thinking about how much hope he and I have to dream about things we want for a future. Hope is what allows us to imagine a future. Hope is what allows us to look past this moment and trust that we get to experience the next. And that is when it came to me, this lyric and what Ben Gibbard meant by it. I have always known what he meant by it but I am understand it on a deeper level. My husband and I have plans for our future, we believe that we will get to have a future, we believe we have children who will have a future. We are able to look so far into our future and imagine all the possibilities.. That takes courage and it takes hope. It made me feel better in such tense times to recognize we have not lost our hope, it is sitting right here next to us just as it always has been. In spite of everything I still believe people are really good at heart. 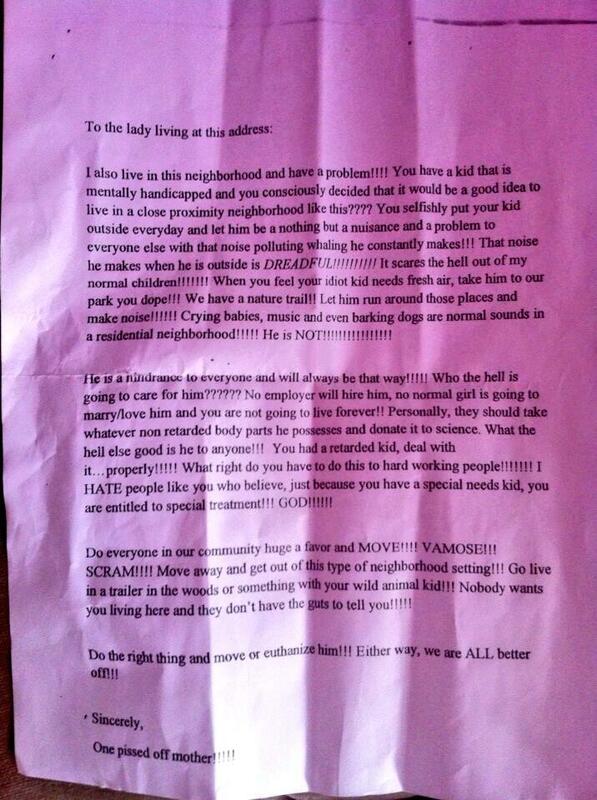 If you have not heard about this hate letter sent to the grandmother of an autistic child here is the link to the story. My sister-in-law showed me this story yesterday when my family came over for our weekly dinner. It is taking a while for me to sort out my feelings about it. After reading the actual letter my most fundamental reaction was shock and anger and that is not just because my nephew is autistic, I think most people would feel one of those two emotions after reading something steeped in that much hate. I had a lot of questions, not necessarily for my sister-in-law just in general. After talking it out the initial conclusion I drew is that this woman lacks empathy. That in itself surprises me really. One of my first questions was “how, as a mother, is she able to harbor that much resentment towards a child? a disabled child at that?” I was working under the presumption that most mothers would be able to put themselves in the shoes of that child’s mother and consider how they would feel if it was their child in that position. Well without empathy you are unable to do that. The woman also seems to have a strong sense of entitlement. At the bottom of all of it though what we are really looking at it is ignorance. She is no different from any other bigot out there, she is just targeting an autistic child versus the gay community, those of different races or religions etc. It is sad to follow yesterdays post about longing for a sense of community and brotherhood with a post that holds an example of such a stark contrast to that ideal. I was just saying how there are so many of us that have good in our hearts and want to take care of each other, this woman is out to prove me wrong. But fear not, this idealist is not easily dispirited. I would never dream of sharing such hateful news without providing a silver lining of hope. Ironically, it is the following news link that made me cry, not the previous.